Kate Hudson arrives at the 24th annual Screen Actors Guild Awards at the Shrine Auditorium & Expo Hall on Sunday, Jan. 21, 2018, in Los Angeles. 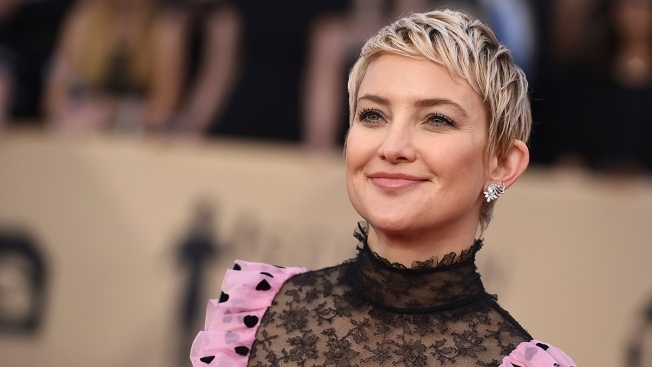 Actress Kate Hudson doesn’t plan to treat her 3-month-old daughter, Rani, any differently than her two sons. Rani is Hudson’s first child with boyfriend Danny Fujikawa. Her sons Bingham Bellamy, 7, and Ryder Robinson, 15, were born from previous relationships. Hudson isn’t the first celebrity parent to forgo gender norms when raising their child. Angelina Jolie and Brad Pitt helped their daughter Shiloh break gender norm when she was as young as 4-years-old and wanted her hair cut short. Shiloh, now 12, often sports suits and traditionally boyish clothing down the red carpet. British singer Adele has had similar experiences with her kids. Like her daughter Rani, Hudson also grew up surrounded by older brothers. And in their own way, she and her brothers ignored gender norms, too.